This week has been super busy and felt longer than usual. Yoga was on Tuesday (the museum people had booked the hall for the Wednesday), so I spent all of Tuesday thinking it was Wednesday- the most disappointing way to have your days mixed up. This feeling continued during the week which is never good. I managed a short run after work on Wednesday, but got home late on Thursday and needed to walk around to the shop so decided to do that instead of rushing to fit in a run. I was going to head to Panshanger on Saturday, but then on Friday night I remembered that I had looked into Oak Hill parkrun before- it’s near to Cockfosters tube station (we sometimes drive to park there, or by Oakwood, when going into London) and seemed fairly straightforward to get to, with a car park at the start. Panshanger was really muddy last week and Oak Hill looked like it was all on paths (it was), so I decided if I woke up in time on Saturday I’d head there instead. The journey was about 30 minutes, and in the end I left at around 8.10 (I need to leave lots of time for getting lost)- the journey was fine until the satnav told me I had reached my destination when I was driving along a residential road. I drove down a big hill and saw some runners running up it, and briefly considered putting the window down and shouting to see if they were going to parkrun, but I was too slow. As I looked for a place to pull over at the bottom of the hill, I saw the entrance to the car park and cars pulling in- phew! It was about 8.45 but cold, so I sat in the car for a bit, watching loads of people with hockey-type bibs on gather around. It slowly dawned on me that they were some sort of fitness group and nothing to do with parkrun, so then I had a panic that I was in the wrong place. I got out of the car to look and then thankfully could see the finish area taping and the blue and white of the RD’s vest- phew! It was a proper “flash mob” parkrun- stood around at 8.50 am there were maybe 30 people, and not many when they did the new runner briefing. The course was just under 3 laps, and the run briefing was done at the finish area, and then we walked the short way to the start. By the time we were at the start there were loads of people (239 in fact). 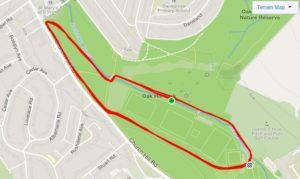 As I am running a 10k race tomorrow, I didn’t want to push the pace too much and just focused on going steadily and overtaking a few people in the final lap. I managed to speed up each mile, with 9.39, 9.17, 9.04 and 8.10. 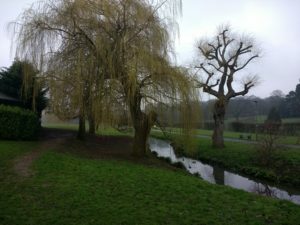 The park was quite pretty with a small river running through it with willow trees on the banks. 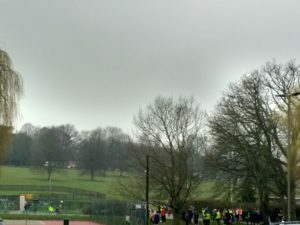 It would be a fairly fast course I think – there was a gentle uphill and then a slightly steeper short bit, followed by a downhill to the finish area, but it was all on paths and although it was busy at the start you could always overtake by running into the grass. It reminded me a bit of Mile End parkrun- not pancake flat but felt like it could be fast. Once finished I had my token scanned (the token said 265, but then had a sticker on it saying 143, and then when the results came through I had position 140) and then did a few stretches before heading home. Thankfully the forecast rain had stayed away. I’d worn my new apricot half zip top (I caved when they had them for 30% off)- I’d tied it around my waist after the first lap when I had warmed up, so as soon as I finished I put it back on again as it was fairly chilly. The drive home took longer but I was still home at about 10.15 which wasn’t bad, and I had a lovely breakfast waiting for me at home. 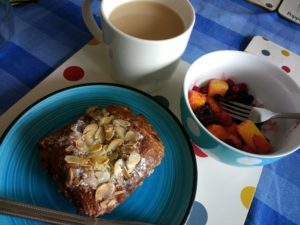 Chocolate almond croissant, mango and berries, and some love potion tea from Bluebird. 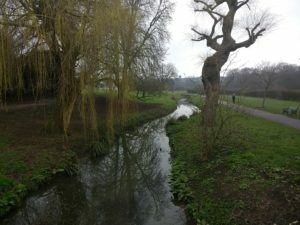 I am sort of ticking off the letters from the alphabet for parkrun, although I am still really just doing parkruns that happen to be nearby when I am somewhere else. I was quite pleased with the time of 29.15, and another letter ticked off and my 39th different parkrun course. Did you enjoy a parkrun today? Are you good at navigating to new places? I really find it hard to drive when I don’t know where I am going, and I have a terrible sense of direction so I can feel like I am going around in circles- going to places like this is good for me I have decided because it forces me to get out of my comfort zone and also show myself that I can usually find my way on my own. Well done you on venturing somewhere new. We usually do southampton or Eastleigh but keep talking about going further afield. Southampton had about 800 today which is down on the usual 1000+ but it still took 30 seconds to get through the crowd and start running properly. Good luck with the race tomo. I’m trying something new and doing a 5k trail race. I’ve done both of those before (Andy’s Grandma lives in Southampton so it’s handy to combine a trip down there with a parkrun)- Southampton was the busiest one I’d been to at that point with the funnel system- very different to some of the ones near me that get 50 ish runners. We were tourists this weekend too as we had a night away in a hotel and spotted the opportunity! Generally we don’t have much opportunity to visit different parkruns as although there are many in Scotland (35 I think) almost all are more than 30 minutes away so it’s quite an undertaking for 5k. There is supposed to be a new one starting not too far away quite soon though, so maybe I’ll up my tourist game! 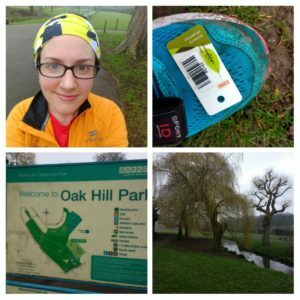 Well done on another letter and another parkrun! I think I’ve done just over 40 different ones too. I do hate trying to find them on my own. I’ve done it a few times and it can be so stressful. Luckily the past few ones I’ve done I’ve been with other people! It’s not so bad even if I am driving and someone else is helping with the navigating- if I go with Dad then I might drive and he can hold the satnav and help with working out where to turn etc. It is good for me though I have decided. You’ll be finished with the alphabet soon. You are doing so well with it- doing that sort of thing with other people is always good fun too. 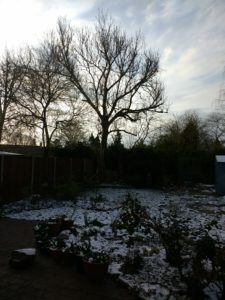 Previous Previous post: Seriously snow, what is the deal?? ?